And so it is the iPad. Really? Wow, not the best name IMHO. I found the Engadget liveblog to be the best. And now that they've reorganized into oldest first, a great recap. Go ahead read it, I'm not going to recapitulate the whole event here. It was a great Jobsnote although maybe not his greatest. My own takeaway: Apple's strategy is right there. They began with the success of their stores, then with the App store, then talked about being a $50B company. This is all because they have an awesome platform. Then they extend the platform to fill a perceived gap between the handheld and the laptop. Of course the iPad supports the App store, of course all those iPhone apps will run on it, and of course they are not including Flash (they want their gatekeeper status!) It all makes sense. The parts I found slightly confusing were: 1) no camera, 2) no USB. Everything else makes sense including the WiFi-only and G3 options (think iPod Touch and iPhone), and the simplicity. Look at all the stuff they left out. It is too bad they didn't come out with some kind of groundbreaking new input technology, but a decent multitouch tablet is pretty good. BTW largely neglected in the recaps was the iLife inclusion. That was not accidental. Apple spent a lot of time and effort reworking the entire UI of those apps to work well on a tablet. This could be "a computer for the rest of us." BTW2 yeah, this will be a threat to the Kindle. I'm not ready to swap mine yet but we'll see. The Kindle replicates a great book experience, the E-ink, battery life, etc. The iPad might be able to surpass it with new stuff. We'll see. I noted earlier that this event would be compared to analyst expectations, and by that standard many analysts were disappointed. They each seemed to have a separate take, but the big dings were 1) Flash, 2) AT&T, 3) no multitasking, and 4) low screen resolution, in approximately that order. Cult of Mac: iPad Opens Vast New Software Development Horizons. This is the right angle IMHO. 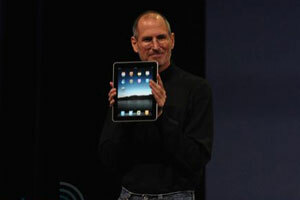 TechCrunch: Investors Didn’t Like The iPad Until They Heard Its $499 Price. I think most people were surprised the prices were so low, that was a nice surprise. Adobe: Flash will run on iPad, even full screen. Yippee. This is via a cross-compiled which generates native iPhone / iPad apps. You can get this will be a big seller if it works. John Gruber: The iPad big picture. "And so my takeaway from this - with the bragging about making their own CPUs and their annual revenue and their size compared to companies like Sony, Samsung, and Nokia - is that this is Apple’s way of asserting that they’re taking over the penthouse suite as the strongest and best company in the whole ones-and-zeroes racket." This is terrific: When Hitler found out about the iPad. Dave Winer is underwhelmed: Apple's jumbo Oreo. "But given the lack of imagination and execution in this product, it's a cruel joke that illustrates that all that remains of Apple's brilliance is Apple's arrogance." Scott Adams: what do you compare it to? "The iPad doesn't feel like a genius creation. I think Jobs was focused on his health when the iPad was conceived. It looks like committee work to me." O'Reilly: Check Mate: Apple's iPad and Google's Next Move. "There is an axiom that the biggest game-changers often result from ideas that, at first blush, seem easy to dismiss. So it goes with yesterday's launch of the iPad, Apple's entry into what they call the 'third category' of device -- the middle ground that exists between smartphone and laptop." Russell Beattie summarizes the prognosticarians' lament: What we really wanted was a MacPad not an iPad. Stay tuned, I'm sure this will be blog chowder for some time to come! PS I am going to get one? What, are you kidding? How about you?